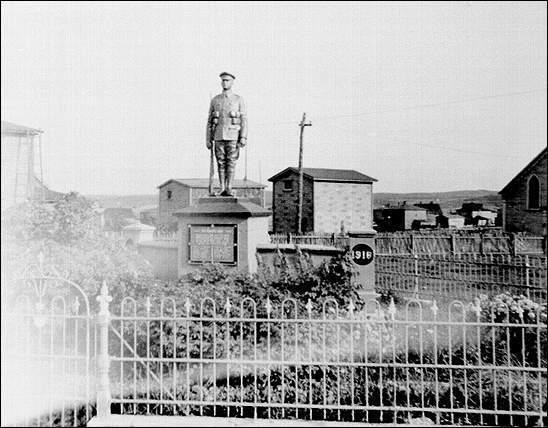 When the First World War ended, there was considerable debate over the nature of the memorial that should be erected to commemorate Newfoundland and Labrador's war dead. Many favoured a traditional monument, but others strongly advocated the foundation of an interdenominational post-secondary institution, primarily to train teachers. The second suggestion was supported by all the churches. Courtesy of the Rooms Provincial Archives Division (E-14-10), St. John's, NL. 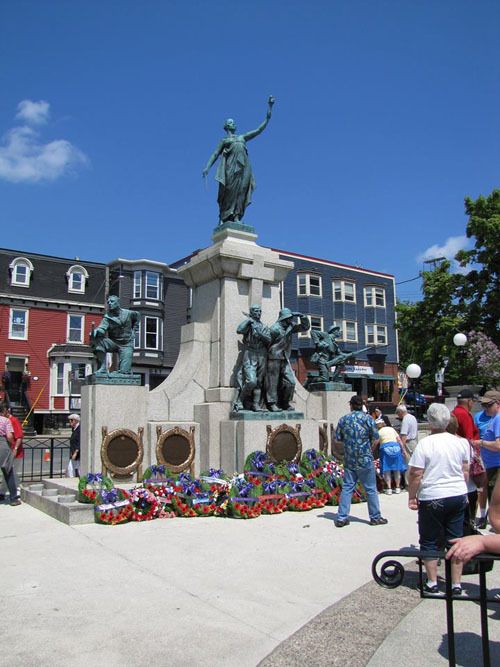 In the end, the Newfoundland Patriotic Association (NPA) and the Great War Veterans' Association recommended to the government that there should be two national memorials. One would be a monument, "of imperishable material, as dignified and beautiful as our means will allow," (MacLeod 18) and the other an educational institution. The government accepted this recommendation. In the early 1900s, the education system in Newfoundland and Labrador was woefully inadequate. Illiteracy rates were high, many teachers were untrained, and anyone wishing to pursue higher education had to travel to Canada or elsewhere. 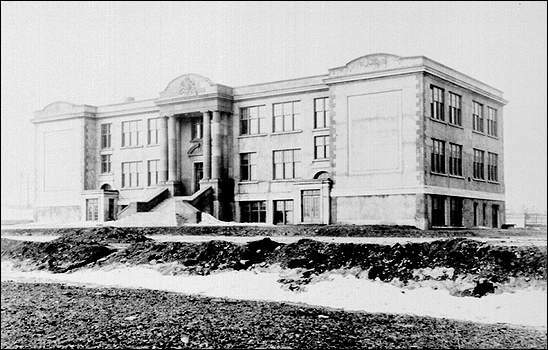 A Council of Higher Education had formed in 1890 to advocate for the creation of a post-secondary institution on the island of Newfoundland. By 1913, the superintendents of the major denominations also called for the raising of teacher training standards. 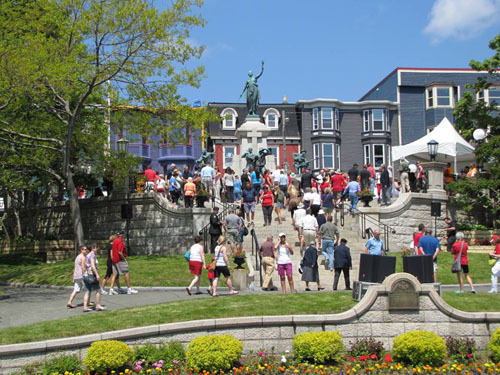 Widespread enthusiasm to create a war memorial after 1918 bolstered the movement to establish a college in Newfoundland. A post-secondary institution was widely perceived as a way to honour the dead and bring about far-reaching positive change by providing effective teacher training and higher education in the arts and sciences. Memorial University College opened on September 15, 1925. Its campus covered nearly two acres of land at the intersection of Merrymeeting Road and Parade Street in St. John's. Its single building included an assembly hall, library, lecture rooms, offices, and laboratories for biology, chemistry, and physics. In 1949, the provincial government transformed the Memorial University College into a degree-granting institution. The university moved to its present Elizabeth Avenue campus in 1961. Photo courtesy of Memorial University of Newfoundland. 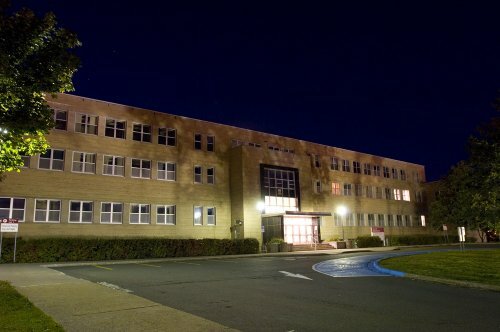 On September 21, 1964, the Newfoundland Command of the Royal Canadian Legion installed a plaque in the institution's Arts and Administration Building, which reads: "This university was raised by the people of Newfoundland as a Memorial to the fallen in the Great Wars 1914-1918 and 1939-1945, that in freedom of learning their cause and sacrifice might not be forgotten." Today, the Memorial University remains a living memorial to those who served in the First and Second World Wars. 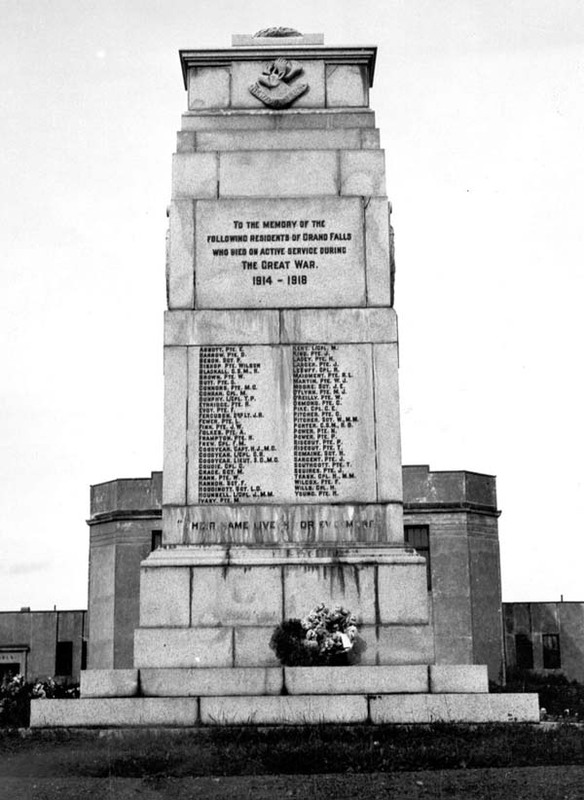 Many other monuments were erected across the dominion in the 1920s to honour the men and women who served overseas. The most elaborate was the National War Memorial in downtown St. John's. It was funded in large part through public donations, in the form of "dollar shares" to the Newfoundland War Memorial Company Unlimited. Field-Marshal Earl Douglas Haig unveiled the memorial at 11 a.m. on Tuesday, July 1, 1924 - eight years after the Newfoundland Regiment's tragic advance at Beaumont Hamel. About 20,000 people were in attendance, including "hundreds of visitors from other lands" (Evening Telegram July 3, 1924). The memorial is located in the downtown's east end, between Water and Duckworth Streets. A bronze statue of a woman stands atop the memorial's central pedestal. She represents liberty and the dominion's willingness to serve in the First World War. Below her stand four other bronze figures: a sailor of the Newfoundland Royal Naval Reserve, a soldier of the Royal Newfoundland Regiment, a seaman of the Mercantile Marine, and a woodsman of the Newfoundland Forestry Corps. Sculptors Ferdinand Victor Blundstone and Gilbert Bayes designed the statues and E.J. Parlanti cast them in bronze. The monument faces the harbour and sits on a stone plateau at the top of a stairway that rises from Water Street to Duckworth Street. It is partially enclosed by a low, semicircular, granite wall. 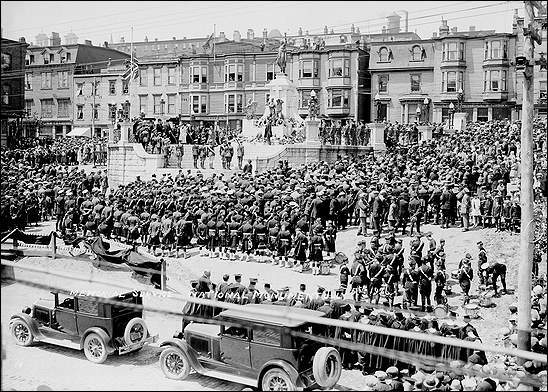 "The monument itself is one of which any city might well feel proud, and it fittingly commemorated the glorious sacrifice made by those Newfoundlanders who laid down their lives for King and Empire in the Great War. In design it is remarkably appropriate, and beauty and grandeur have been combined to make a tout ensemble which is most imposing. ... To attempt to do full justice to the Monument in cold print is an utter impossibility. It rests now, an imperishable Memorial to our gallant dead, and a shrine which generations of Newfoundlanders will venerate as a vital reminder of the price which was paid by so many of their compatriots that the world might be made safe from the perils of militarism." Communities and groups established smaller memorials to commemorate their dead. 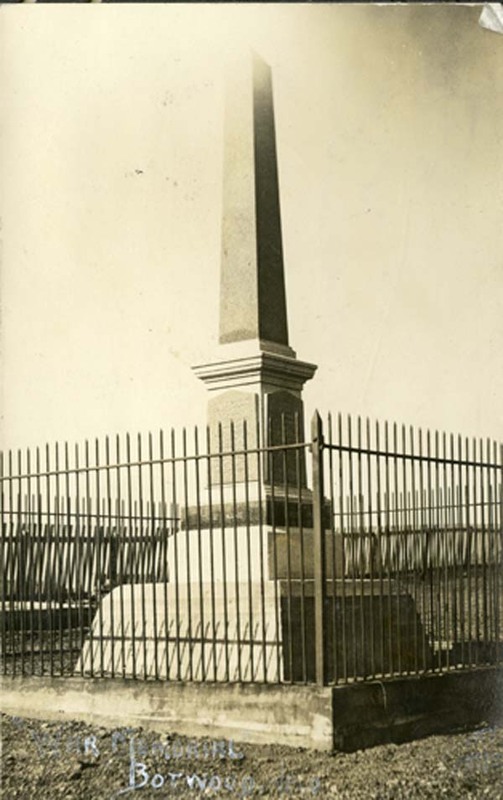 The residents of Botwood raised money for a 12-foot grey granite obelisk from D. Beveridge and Son of Perth, Scotland. 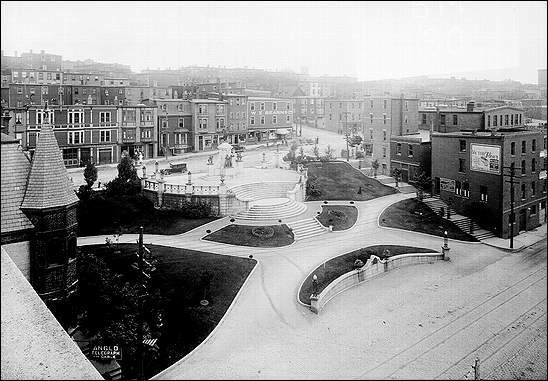 The obelisk was unveiled July 1, 1921. Inscribed on it were the names of those who had died overseas, as well as the epitaph: "Their names liveth for evermore." Courtesy of The Rooms Provincial Archives Division (VA 157-101), St. John's, NL. In the small outport community of Arnold's Cove, residents purchased a plain granite shaft which they erected as a memorial to their war dead on August 7, 1921. That same year, monuments were also unveiled at Bell Island, Carbonear, Fortune, Trinity, and St. John's. More monuments were unveiled the following year. In Grand Falls, a replica of the Cenotaph in London was unveiled on Station Road on July 23. The $8,000 monument was paid for by the people of Grand Falls with assistance from the Anglo-Newfoundland Development Company. War Memorial 1914-1918, Grand Falls-Windsor, n.d. 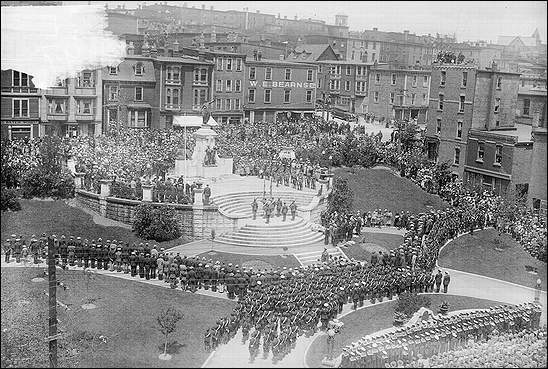 The Fighting Newfoundlander was unveiled in Bowring Park in St. John's on September 13, 1922. 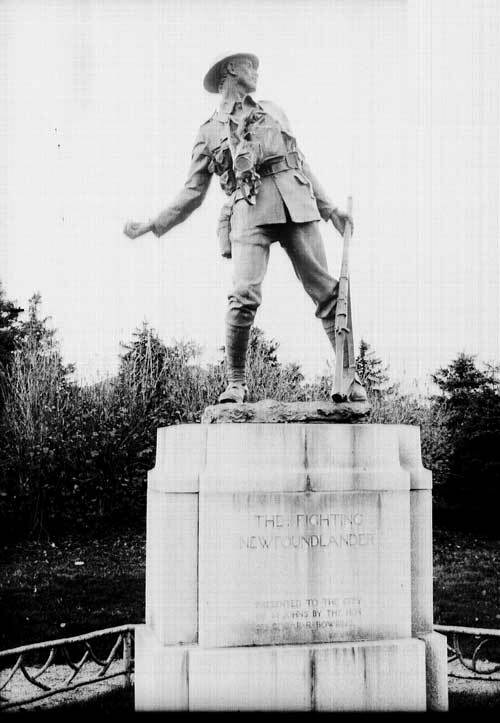 Corporal Thomas Pittman, who had served on the front lines during the Battle of Beaumont Hamel, posed for the statue, which was sculpted by Captain Basil Gotto. A second of Gotto's statues was installed in the park on July 1, 1928. It depicts a caribou, which is the emblem of the Newfoundland Regiment. Five other caribou statues were made and installed at battlefield parks in France and Belgium. The incription on the base of the statue reads, "The Fighting Newfoundlander. Presented to the city of St. John's by the Hon. Edgar R. Bowring". Courtesy of The Rooms Provincial Archives Division (F 10-6), St. John's, NL. Other permanent forms of memorials were also established. On October 17, 1920, the Terra Nova Council of the Knights of Columbus laid the corner stone of its new Knights of Columbus Memorial School in St. John's. The school was established to promote Catholic education in Newfoundland and to remember the members of the Knights of Columbus who died in the war. It was built as an extension to the already existing Academy of Our Lady of Mercy near the Catholic Cathedral. The building contained 12 large classrooms, a domestic science room, music and dressing rooms, a water fountain, and a large auditorium. Every year, people gather at many of these memorials for two public ceremonies. On July 1, Memorial Day ceremonies commemorate the anniversary of Beaumont Hamel, and on November 11, Remembrance Day ceremonies mark the anniversary of the signing of the Armistice, which ended hostilities.